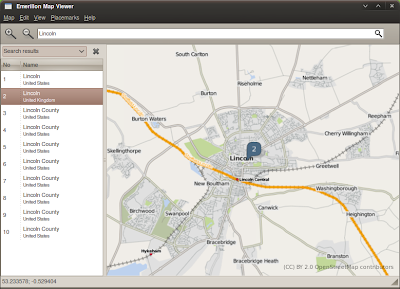 Desktop Map Viewer "Emerillion" For Ubuntu - OMG! Ubuntu! 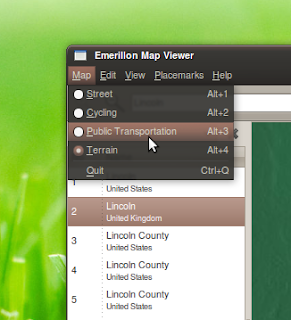 Emerillon is a map viewer for GNOME that uses OpenStreetMap data (a wiki for maps) to display custom “views” such as transport, cycle routes and terrain as well as the general “street” view. Given that the application has yet to release a stable version I was incredibly surprised by how stable, usable and, most importantly, helpful it was to use. Even my dinky ol’ town in the United Kingdom has data on-board OpenStreetMaps and works flawlessly in Emerillion. Kudos to the developers behind it. The different “views” (as i shall refer to them as) are really helpful and give the user something Google Maps doesn’t offer as of yet to desktop users. They can be cycled through using the ALT+1,2,3,4 keys making it even easier. Emerillon is a perfect application for netbooks, too. not only is it quicker to get to and use than Google Maps, but the “data” it uses isn’t as large to download making it feel snappier over all. First things first, the default set up of Emerillion is lame – there is no working search bar and no easy way for a new user to figure out how to use the application. One must first manually enable four plugins in order to gain a search bar, place-marks, co-ordinates and web links. Going to View – Toolbar helps somewhat and searching via this auto-opens the sidepane so you can sift through results. An alas, poor Emerillion doesn’t seem to have an icon yet! The PPA also includes the package “ethos” which is a dependency for Emerillion.